The Office 365 Global Address List. Synced to every company smartphone. Why sync the GAL with CiraSync? With CiraSync, there’s no need to run an app when a new employee is added to the company GAL. Just set it and forget it. CiraSync grows with your company. It can sync thousands of contacts to thousands of smartphones. Company GAL overflowing with legacy contacts, test mailboxes, or service accounts? CiraSync sorts and filters to avoid syncing unwanted contacts to mobile users. Rest easy knowing your contact data is secure and backed up. Why settle for a one-size fits all solution? 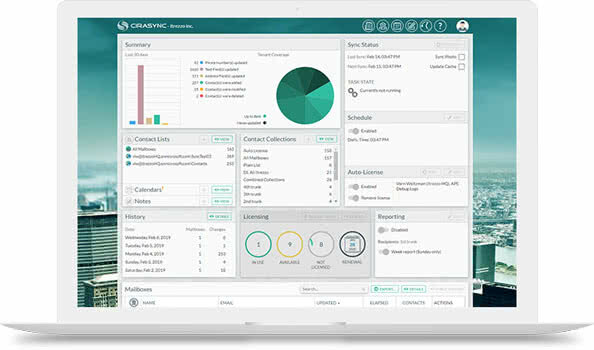 It takes less than 5 minutes to configure CiraSync to suit your company’s specific needs. USING PUBLIC FOLDERS FOR CONTACTS? CiraSync is the fastest and most flexible way to sync Public Folder contacts and calendars to Androids and iPhones.